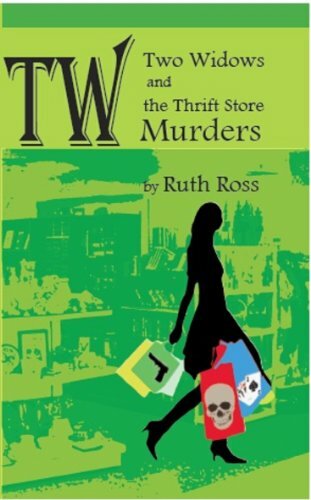 As the first in the Two Widows Mystery Series by Pacific Northwest writer, Ruth Ross., Two Widows and the Thrift Store Murders is a humorous and touching tale of murder, mayhem, and great bargains. Widow Millie Mahoney is a dabbler. She dabbles in all sorts of things: art, writing, politics, and sometimes employment. Unfortunately, nothing captures her attention for long, at least not until she finds herself dabbling in murder. Millie's mother, Margaret Cisneros is also a widow, but she doesn't dabble like her daughter. Instead, she quilts. She’s also the voice of reason with her occasional efforts to keep Millie on track and the dog out of trouble. But even Margaret can't resist going along on this particular shopping trip. Join the Two Widows as they find more than they bargained for at the local charity thrift store. This was such a delightful cozy mystery. Two Widows and the Thrift Store Murders by Ruth Ross is fast-paced, funny, and well-developed. I loved Millie and Margaret and the author does such a great job at making the characters well-rounded. You feel as if you really do get to know these women. I just love the style of writing in this book. If you love cozy mystery, read this! This sounds right up my alley! Adding it to my list!